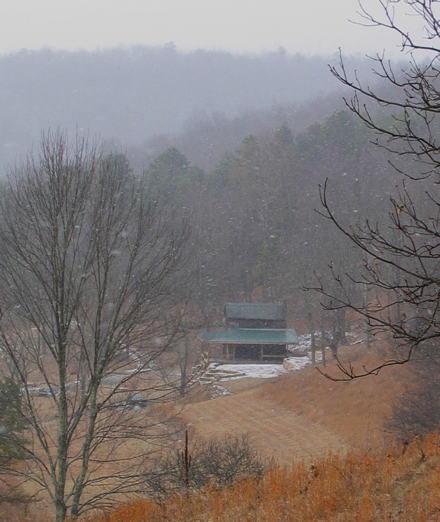 On BCCS property, near the entrance to Butler Cave, we have a field house we call "The Homestead." The property is less than a mile north of Burnsville, Virginia on Route 609. The street address is 11429 Dry Run Road, Williamsville, VA, though not all mapping services locate that address properly. The Burnsville area is rural, with no stores or gas stations nearby. Please print out, complete, sign, and bring with you a completed waiver. Bring with you what you will need for the weekend. The nearest convenience store and gas station is about 25 minutes away, and the grocery store is about 35 minutes away. We ask that everyone pack out their own recyclables. Some folks like to bring a fine local craft beer in a growler to minimize hassle. 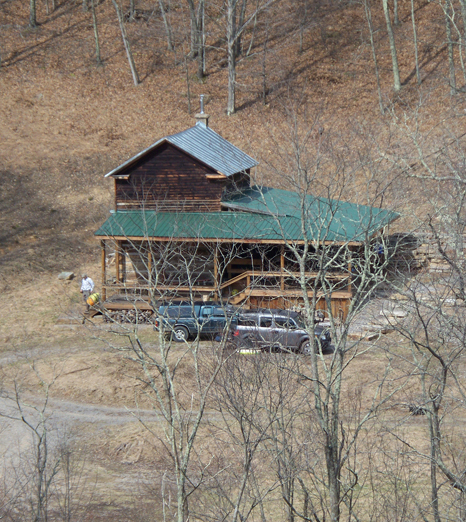 The building is an old 2-story log cabin that had been the Butler family homestead for generations. Inside there are chairs and a sofa, with a wood stove for heating the cabin in cold weather. Upstairs are 12 bunk beds, 8 of them with mattresses. No electric, no phone, no cell service, no running water. There is a large field for tent camping, with many camping spots shaded by trees. It is always a good idea to bring a tent in case all the bunks are taken. Outside, under the porch roof, we have 7 propane burners that you can cook on and a sink for washing. There is also a gas grill and two charcoal grills for cooking. Most people bring their own plates, pots, etc., but we have an assortment of plates, cutlery, glassware, pots, pans, etc., that you are welcome to use. Please wash anything you use, and put it away inside the cabin cupboards when you leave at the end of the weekend. Items left in the drying rack by the sink get very dirty; sometimes they blow away and break. There is a large stone patio with picnic tables, and a stone fire ring for evening camp fires. For safety, we do not allow open flame in the homestead or on the porch. So no candles, oil lamps, portable propane lanterns, or other sources of fire. Only the wood stove, the installed propane stove, and the installed propane lanterns are allowed. You may want to bring an extra head lamp or a battery-powered camp lantern. We recommend that you bring drinking water for the weekend. There is a spigot in the lower field below the parking area that has water from a good spring for cooking, washing, and bathing. Many people drink it, but it has not been tested. Water needs to be fetched from the spring, so please do your share of the fetching with the 5-gallon blue jugs. There is also warm-weather outdoor shower fed from the lower spigot; and if you build a fire under the tank you'll have a hot shower. We have a wood-heated hot tub near the shower you can setup. There is also a upper spigot by the porch sink that is fed by an upper surface pond and spring. As this is surface water, the quality is highly suspect. Some people make coffee with it and use it to wash their dishes, but it is safest to not use it, especially during the dry months when the pond begins to dry up. The driveway to the homestead is gravel with one slightly steep hill. 4WD or AWD is recommended. A good 2WD vehicle plus a little skill usually gets up the hill, but not always. If you can't make it up the hill, park at the very bottom by the gate and make the mile-long walk to the homestead; someone will ferry your gear in. If you are accompanying a caver but are not a caver yourself, there many other things to do. 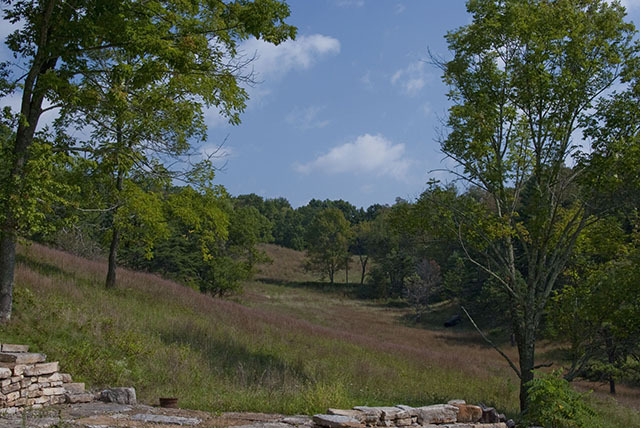 There are wonderful hiking and mountain biking trails in the area. There is also trout fishing and a great swimming hole on the Bull Pasture River. In Monterey there is a little antique and craft shopping, and in Warm Springs there are restaurants and a spa; both these towns are about 30 minutes away. If you stay at the homestead, all trash and recyclables need to be hauled away. We have had problems with animals rooting around in neglected trash and breaking things. On project weekends someone needs to volunteer to haul the trash out, and we ask each person to pack out their own recyclables. We do not charge for staying at the homestead, but we do appreciate your assistance in keeping it neat, clean, and well-maintained. Donations of large heavy-duty trash bags and toilet paper are always useful and appreciated, and you might really be happier if you bring them!